3/16" ID x 1/4" OD x .030" Wall ALTAFLUOR® 200 FEP Tubing | U.S. 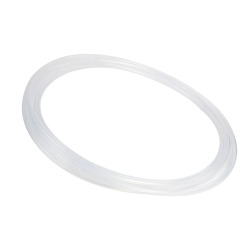 Plastic Corp.
ALTAFLUOR® 200 FEP offers excellent clarity, which makes it ideal for sight glass/flow monitoring applications like chemical process, laboratory applications, UV water purification systems, ground water monitoring, food processing, electrical insulation and automotive. Maximum working pressure 223 PSI @ 73°F.